Breakfast at 9:00 am, Tea at 2:00 pm. Please join us for our annual Inviting Vines Garden Tour with events to celebrate our twelfth year of fabulous gardens featuring clematis. In addition to the Rogerson Clematis Garden there will be four private gardens for you to visit. In addition to the open gardens, special event guests will enjoy either a continental breakfast in the milking parlor of the barn at Luscher Farm while Maurice Horn, owner of Joy Creek Nursery (author, speaker, and founding member of Friends of the Rogerson Clematis Collection), shares his history with Brewster Rogerson and his role in connecting the clematis collection to the brilliant work of Japanese hybridizers. Or, enjoy the tour and the afternoon tea featuring Judy Alleruzzo and Bill McClenathan of Garden Time TV for an improvisational conversation about their gardening experiences…both good and bad…with clematis in their gardens. If you have time, you may opt for both breakfast with Maurice and tea with Judy and William. There will be lots of clematis to purchase at the Rogerson Clematis Garden and a garden-themed gift basket silent auction benefiting the Garden. Feel free to start your day’s adventure at any of the gardens at 11:00 am if you can’t join us for the special event breakfast. See you there! Tickets for the tour only are $25 and available through the day of the event at the select local nurseries listed below, at the Garden at Luscher Farm on the day of the event, or online now (see below). Nurseries selling tickets for the garden tour only (without the breakfast or tea) are Dennis’ Seven Dees Nursery (Lake Oswego, Cedar Hills), Garden Fever Nursery (N.E. 24th), Gardener’s Choice (Tigard), and Al’s Garden Center (Sherwood, Wilsonville, and Woodburn). Tickets for the breakfast and tour are $50, tickets for the tea and tour are $50, and all-inclusive, all-day tickets including breakfast, tea, and tour are $75, and are only available below. There will be four private gardens on the tour. More details to follow. The Rogerson Clematis Collection Botanical Garden at Luscher Farm occupies an acre and a half around the circa 1900 farmhouse. Most paths are ADA-accessible compacted gravel. The Garden is the home to the Rogerson Clematis Collection the largest and most complete assemblage of clematis in a public garden. Also, the Collection is the only clematis Collection fully accredited by the American Public Garden Association and the only fully accredited collection in Oregon. Over the past ten years, we have transformed the Luscher farm's orchard, garden and meadow into a horticultural showplace and botanical research site. Our Garden contains the most comprehensive collection of clematis within a public garden in North America. The Collection contains unique and exceptionally rare plants, as well as historic clematis and the newest hybrids. Gardens include the Heirloom Garden with pre-WWI clematis, roses and cottage garden plants; the Beech Tree's Garden with Japanese clematis species and cultivars in a bird-friendly setting with native plants and allies; the Front Bank Gravel Garden with plants that do well in hotter, drier conditions featuring many North American native clematis; the Baltic Border with clematis hybrids from Estonia, Latvia, Lithuania, and Russia; three beds of Polish Clematis bred by Noll and Franczak; clematis from the International Clematis Society's "Clematis for Beginners" list; the In-Steppe Garden features clematis native to the steppe regions of eastern Europe and central Asia, and their hybrids; west of the greenhouse re-blooming C. alpina and C. macropetalahybrids climb a 65'-long Viburnum tinus hedge; and the Founder's Garden located around the sundial, contains Brewster Rogerson's 40+ favorite clematis species and cultivars. There is also the test garden for your observation. The most recent addition is the Modern Garden planted in Fall of 2015 with over three hundred plants introduced since WWII. The garden is designed for you to stroll at your leisure and learn interesting ways to integrate clematis into your own landscape. Docents will be available to answer questions at the Rogerson Garden and greenhouse. NO dogs are allowed. Port-a-potties are available. You are welcome to take pictures. There will be unusual clematis plants and merchandise for sale in the FRCC greenhouse. Guided tours with docents throughout the day. 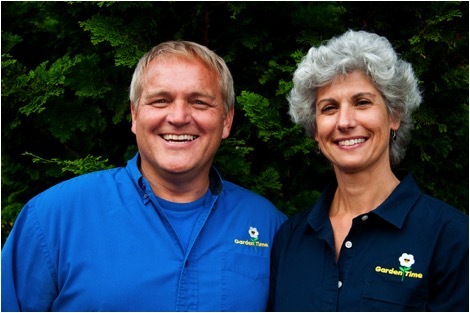 Tea and presentation with Judy Alleruzzo and Bill McClenathan of Garden Time TV at 2:00 pm in the milking parlor of the barn. Food and Drink: Each garden will have hosts available to answer questions and light refreshments available throughout the day. Plant Sales: We will have a nice selection of clematis plants for sale at the Rogerson Clematis Garden at Luscher Farm from 11 a.m. through 4 p.m.
Join us for a wonderful day in the gardens!